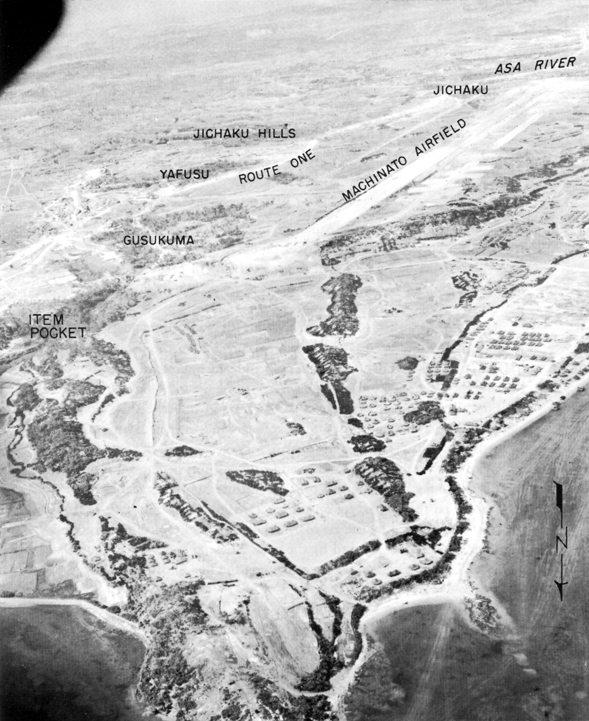 The forward surge of the American lines on 24 April marked the fall of the first Shuri defense ring everywhere but on the extreme right, in the Item Pocket area. The enemy had withdrawn to the next ring of prepared positions of the Shuri defense zone and was ready to repeat the process of making the invader pay for every foot of ground. While the attack against the second ring of Shuri defenses was under way, there was a major regrouping of the weary American forces at the end of April everywhere on the line except on the 7th Division front. The 27th Division on the west was relieved by the 1st Marine Division, and the 96th Division in the center of the line was relieved by the 77th. These changes were completed by 30 April. The 7th Division was to remain on the line until relieved by the 96th after its 10-day rest. break through the Shuri defenses alone. After the cancellation in the middle of April of Phase III for the Okinawa campaign, the conquest of Miyako, the III Amphibious Corps became available to General Buckner for use on the southern front. The 1st Marine Division in the north was to go south first since it was closer to the Shuri line and could be moved into position more quickly than the 6th Marine Division. Despite this redisposition, the use of fresh troops, and some of the most intensive efforts that the campaign had yet seen, the Americans fought for an entire week without making any significant gain except in the center of the front. In large measure their failure was due to the difficulty of appraising correctly the nature of the interlocking Japanese defenses that they now faced. The enemy also reinforced his line in this area. On 26 April General Ushijima ordered the 44th Independent Mixed Brigade to take a position west of Shuri and north of Naha at the Asa River, behind the remnants of the 62d Division. Thus the 62d Division would be supported if a break-through threatened on the west coast. The initial objective of the 1st Marine Division was the north bank of the Asa River. Immediately in front of the division, between it and the Asa River, was a series of hills and ridges. On this high ground the Japanese had prepared defensive positions in depth which were to occupy the Marines well into May. On 30 April, and again on 1 May, while the 5th Marines were moving into the line, the 1st Marines tried to push south, but on each day it was repulsed with considerable loss of life; on 1 May one company alone suffered twenty-four casualties. The 2d of May was wet and chilly, but the marines, two assault regiments abreast, pressed the attack. On the left, next to the 77th Division, the 5th Marines met stubborn resistance. Again, for the third day, the 1st Marines met trouble trying to cross the draw south of Nakanishi village to reach the Jichaku ridge mass. Marines of Company B, one at a time, attempted to cross over a blown bridge. Three of the first five men were hit in the attempt. One man negotiated the top of the south bank. The next three men to follow him were shot in the head. After this bloody reception the company hugged the southern bank of the draw until 1300, when it was ordered to withdraw. In the confusion of the withdrawal, a large number of men were left behind. Eighteen men, five of them wounded, who had not known of the withdrawal order were brought back after dark. KOCHI AREA, where the 96th and 77th Divisions attacked vital Japanese positions. Attempting to reach Kochi through Onaga, south of Skyline Ridge, these tanks (below) were lost 29 April when the American lead tank blocked the road forward. To the southwest of Kochi Ridge was Zebra Hill, a long, high stretch of ground which climbed toward the still higher ground north of Shuri. A deep road cut separated the lower extremities of Kochi Ridge and Zebra. Opposite the road cut on the east, the Onaga side, were How and Item Hills, both of them flanking this important area. On the other side (west) of Kochi Ridge, and paralleling it, was Hill 138. This high ground surrounding Kochi Ridge on three sides was held by the Japanese. From these points the enemy had observation of the Kochi area, and from the same circle of high ground mortars and machine guns could concentrate their fire on Kochi Ridge, which was also a well-organized strong point. On 25 April the 1st Battalion, 17th Infantry, against surprisingly little resistance, advanced 600 yards across the flat ground on the 7th Division right (west) to occupy the slope of Horseshoe Ridge. The next day the 1st Battalion tried to advance along the west side of Kochi Ridge, and the 2d Battalion along the east side. As soon as this effort began, the reverse-slope fighting technique of the Japanese came into play, and prearranged mortar and machine-gun fire from surrounding heights swept over the area. The attack was stopped and all the troops fell back to their former positions except one platoon of Company G that dug in on the east side of the ridge for a precarious foothold. Neither battalion had observation of the other's movements; neither could gain possession of the crest of the ridge; each fought essentially an isolated action on its own side of the ridge. By the evening of 26 April, it was evident that the 17th Infantry had come up solidly against the Japanese manning the Kochi sector of the line. The next day, a rainy, muddy day, efforts to establish physical contact between the 1st and 2d Battalions failed. There was no gain but there were many casualties. Kochi Ridge defenses in the rear and flank. He succeeded in getting Company K through Kochi to the cut, while Company L moved southward along the west slope. But once at the cut the company received a blast of machine-gun fire that killed four and wounded eight. Thereafter Company K kept under cover until it could work its way back. In the meantime Company L was unable to reach the crest. The attack remained stalled on 29 April. Whenever any serious movement threatened, the Japanese concentrated the fire of from twelve to fourteen mortars on the endangered spot and denied it to the attackers. To add to the misfortunes of the men, twelve rounds of friendly 105-mm. artillery shells fell short, landing in the midst of Company G on the east side of Kochi Ridge. Five men were killed and eighteen wounded in one platoon, and an adjacent platoon was left with only twelve men. In addition to the killed and wounded, there were eighteen cases of concussion and shock. Company G now had only twenty-seven men left in the rifle platoons. On the morning of 30 April, Company E took the place in the line formerly held by Company G and started forward. Suddenly, at 0845, it was hit by cross fire from about eight machine guns located on both flanks and to the front. This was followed by a mortar concentration. Losses were heavy. Twenty men were killed, and in one squad only two men were left. The wounded were helpless. Smoke placed over the men was blown away quickly by a brisk wind and offered almost no protection; even those not wounded were unable to withdraw, and relief parties could not come forward. Medical supplies were finally dropped by a cub plane from a height of fifty feet, in the face of small-arms fire. After dark most of the wounded were brought back . Farther down the slope toward Onaga, Company I was struck by a Japanese counterattack of about 25 men at 1100, and 5 men were killed and 11 wounded. On the same day a carrier-based Corsair strafed behind the lines of the 17th Infantry, killing 6 and wounding 19 in a tragic blunder. Unquestionably, 30 April was a bad day for the 17th Infantry Regiment. Since 26 April the regiment had suffered more than 60 casualties from friendly fire. rice paddies near Unaha and was knocked out, blocking the road. Three of the remaining four tanks turned over or threw their tracks and were lost in trying to turn around. The 32d Infantry was now trying to help the situation at Kochi by putting pressure on enemy positions to the southeast. In a predawn attack on 30 April the 1st Battalion, 32d Infantry, successfully placed Company C on "Chimney Crag" and Company A in the "Roulette Wheel" on the ridge southwest of Kuhazu. Japanese in large numbers infiltrated behind the lines of these companies during the night and disrupted the relief of the 32d by the 184th, the completion of which was to take place before dawn of 1 May but was not accomplished until 1730 in the afternoon. In fighting its way back after being relieved in the line, the 1st Battalion, 32d Infantry, lost eleven men killed and twenty-two wounded. That night, 1-2 May, a penetration was made by Company L, 184th Infantry, to Gaja Ridge just in front of Conical Hill. The advantage gained by this surprise move was lost at the end of the day when the men were withdrawn by company officers in direct violation of orders to hold the ground despite heavy casualties. The fight at Kochi Ridge continued during the early days of May, the 17th Infantry making only negligible gains. 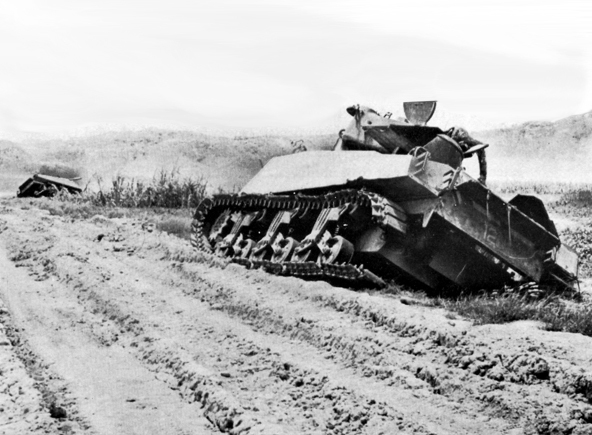 On 1 May an armored bulldozer prepared an approach from the west to the top of Kochi Ridge between Knobs 1 and 2. 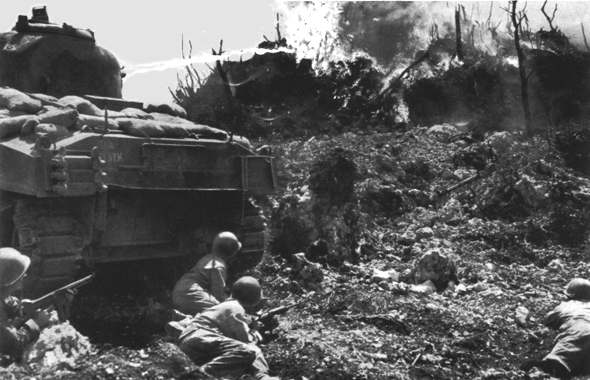 An armored flame thrower moved up the approach and twice burned the area, but it was unable to reach the enemy strong points on the east side just over the crest. Onaga was mopped up during the day, but otherwise the infantry undertook no movement and remained in their dug-in positions, engaging in intermittent grenade duels. At dawn of 2 May the 1st Battalion, 17th Infantry, relieved the 2d Battalion on the east side of Kochi Ridge. It was a bad day, dark with mist and rain. Once again the flame thrower climbed to the saddle between Knobs 1 and 2 and spurted flame at enemy positions. Troops of the 1st Battalion then tried to take Knob 1 from the east side but failed, largely because of the heavy mortar fire which fell on them. During the night sniper positions were dug through the ridge by both battalions to give observation of areas that were hidden from view. forward movement by a mass of artillery and mortar fire, together with intense machine-gun and rifle fire. Grenades also were brought into play. At its eastern end the escarpment terminates abruptly in a gigantic sentinel like monolith, called "Needle Rock." To the left (east) of Needle Rock a 200 yard saddle dips toward Hill 150, and 400 yards east of Hill 150 across another saddle is Hill 152, which marks the corner where the high ground of the Urasoe-Mura Escarpment formation turns at right angles to the southwest. The Ginowan-Shuri road (Route 5) bends around the corner of Hill 152 and then heads southwest toward Shuri, following the slope of the high ground on the west. trations, comprising 1,616 rounds, were fired in the zone of the 381st Infantry alone. Air strikes burned the escarpment with napalm bombs. On 26 April the attack against the Maeda Escarpment was launched. The infantry had little trouble in moving up the forward face, but when Company G of the 381st Infantry clambered to the top of the escarpment it suffered eighteen casualties in a matter of minutes. The Japanese on the Maeda Escarpment used to perfection their technique of reverse-slope defense. It was not difficult to occupy the forward slope of the ground, but the crest and the reverse slope were forbidden land. There the battle was to be fought. Company F at Needle Rock tried to place men on the point of the escarpment by means of a human ladder, but the first three men to reach the top were killed at once by machine-gun fire. Just before dark Company E attempted to occupy some small knolls in Maeda, south of the Hill 150 saddle, but once the men were on the ground the knolls were swept by fire from about a dozen machine guns, which immediately killed two men and wounded six. Four hundred rounds of 81-mm. and 4.2-inch smoke shells were used in screening the withdrawal of the company in the gathering dusk. Farther to the east there was, for a time, promise of considerable success. Elements of the 383d Regiment reached the crests of Hills 150 and 152 to find the ground below alive with Japanese. They estimated that they could see 600 of the enemy, who were unaccountably exposed. Machine gunners, BAR men, and individual riflemen had a field day. One BAR man was reported to have killed thirty Japanese. Tanks and armored flame throwers were able to move into the edge of Maeda and wreak havoc. Scores of the enemy were driven from caves by flame and then shot down as they fled. ing general issued another order: "The army will crush the enemy which has broken through near Maeda. The 24th Division will put its main strength northeast of Shuri this evening." 11 In these orders can be seen the underlying reason why in the ensuing four days the 96th Division gained only yards. The Japanese meant to hold at Maeda and they did. On the left of the escarpment, at the corner where the high ground turns sharply southwest, the 1st Battalion, 381st Infantry, and elements of the 383d Infantry on 27 April worked their way through the saddle between Hills 150 and 152, supported by tanks of the 763d Tank Battalion and armored flame throwers of the 713th. In a notable example of tank-infantry action they engaged in hours of carnage. The tanks and flame throwers burned and blasted enemy positions, flushing out of their underground positions hundreds of Japanese who were then cut down by the infantry or by the machine guns of the tanks. Tanks and infantry penetrated to the south edge of Maeda, but here the infantry was stopped by enemy fire. On top of the escarpment an all-out effort was made to reduce the large underground pillbox that separated Companies F and G, but the attempt failed.12 many Japanese were killed southeast of the escarpment, no ground was won permanently this day except for very slight advances in Maeda near Hills 150 and 152. MAEDA ESCARPMENT viewed from east end of Kakazu Ridge. MAEDA ESCARPMENT STRONG POINTS included the Apartment House and a cave-tunnel-pillow network. 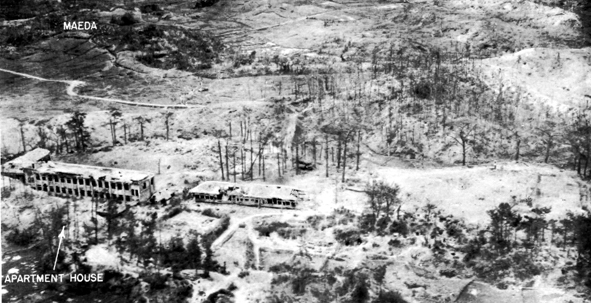 The Apartment House barracks area (above), just east of Nakama, was captured 5 May as the 307th Infantry, 77th Division, cleaned out reverse slope of Maeda Escarpment. Demolitions played a large part in capture of the maze of caves, tunnels, and pillboxes some 200 feet from the east of the escarpment. Great sections of the hilltop were blasted away (below), blocking cave entrances in the escarpment's face. On 29 April the 307th Infantry of the 77th Division took over the Maeda Escarpment part of the line from the 381st Infantry, and the next morning the 306th relieved the 383d Infantry on the 96th Division left. At noon on 30 April, General Bruce, Commanding General of the 77th Division, assumed responsibility for the former 96th Division zone of action on the Corps front. The end of April also witnessed a regrouping among the Japanese units on the line. In response to the urgent orders of the Japanese commander on 26 April, when the Maeda sector was threatened, the 32d Regiment of the 24th Division hurried northward to the Maeda sector but apparently did not take over front-line duty until 28 April. It then went into the middle sector between the 22d Regiment of the 24th Division on the east and the badly mauled 62d Division, which was now occupying the western third of the front. By the time it was relieved, the 381st had been reduced to about 40 percent combat efficiency and had suffered 1,021 casualties, 536 of them in the Maeda Escarpment fighting of the past four days. Some platoons were down to five or six men.17 Many of the men were so exhausted that they did not have the energy to carry their equipment down the slope to the road below where trucks were waiting to take them to the rear. There were innumerable attacks and counterattacks, grenade duels, satchel-chargings of dugouts and caves, horrifying night encounters, and many little strategems used by both sides to win advantages in the hand-to-hand demolition battle of the Maeda Escarpment.-Air strikes, employing both demolition and napalm bombs, were made almost daily against the escarpment positions. Tanks and armored flame throwers worked against the southeastern slope. Yet the top of the escarpment, in the words of the men who fought there, was "all hell rolled into one." It took Lt. Col. Gerald D. Cooney's 1st Battalion, 307th Infantry, on the left side of the line, five days to gain control of Needle Rock. Men of the battalion were driven from Needle Rock and the top of the escarpment nine times before they held them for good. During the night of 30 April-1 May, the 1st Battalion, 307th, brought up to the escarpment four 50-foot ladders and five cargo nets, the latter borrowed from the Navy. On 1 May Company A troops mounted the ladders at the eastern end of the escarpment, but every man who stood up was killed or wounded. Farther to the west, however, Company B, using the cargo nets, had two platoons on the edge of the escarpment by nightfall. About midnight Japanese counterattacked in this area and drove the men off the escarpment. The fighting was especially fierce on top the escarpment on 4 May. 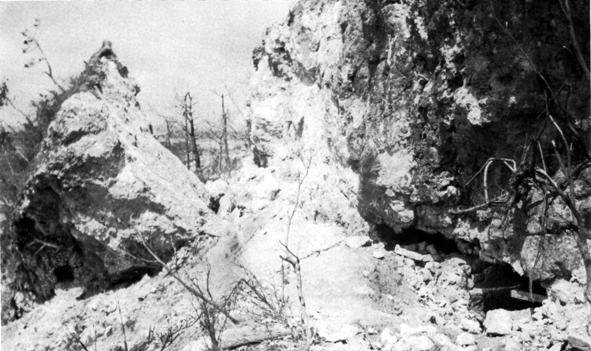 Colonel Cooney's 1st Battalion successfully executed a complicated demolition assault on the big cave-tunnel-pillbox network about 200 feet west of the eastern end of the escarpment. The battalion then held the newly won ground against repeated counterattacks from the southern side. It was estimated that 600 enemy were killed by the 307th Infantry in the fighting at the escarpment on 4 May. Slowly, on 5 May, the reverse slope was taken and caves blasted and closed. On the night of 5-6 May the Japanese staged several counterattacks in an effort to win back the escarpment. An especially severe attack struck the 3d Battalion, 307th Infantry, on the regimental right. In repelling it the 3d Battalion killed 250 enemy troops, largely in hand-to-hand fighting. During 6 May all battalions of the 307th Infantry advanced southward to the slopes of Hill 187. The battle of the escarpment was over. While at the Maeda Escarpment and in a few other sectors the American attack continued through the first week of May, yet, in general, this attack was brought to an unexpected pause after 3 May. (SeeMapNo.XXXI.) On 4May the enemy launched a surprise counteroffensive by which he hoped to wrest back from the invaders all that they had so painfully gained. For a time most American troops had all they could do to hold their own.